It took me some while to get accustomed to the taste and flavors of Thai food. Primarily had to do with the strong pungent tastes of the curries. It really depends on where you try your first dish. The first time I tasted a green curry in a dainty little shanty on the streets of chicago I sweared never to put it in my mouth ever. So strong was the repulsion that I went about warning half the world why they should not out this thing ever in their mouth. Then came a time when I had little option when I was working pretty late in the night. This time I was in Sydney, a place much like Mumbai that is lit up when the world decides to retreat in their cosy beds. A colleague suggested a place for popular for mid-night snacking that serves Indian style food. Anything that brings me closer to home I said. Most take away joints in Sydney offer a paper packaged dish which has 2 curries , rice and a side dish available for as low as 5 Australian Dollar. 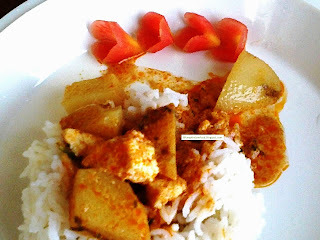 I polished off the dish which had a red curry that tasted close to manglorean style fish dishes. Ofcourse a little sharper in taste. I had decided to eat there for as long as I was supposed to stay. Next day the colleague took me back there in bright day light for lunch. I read the name of the place - Thai centre. I decided to give things a fresh start. After some research I realized that I favor vegetarian thai dishes (I must admit my love for prawns in lemon grass at China Bowl- for some other day). So cutting my story short, I make thai red curry now at home whenever I can lay my hands on galangal and lemon grass. 1) Grind all the ingredients for the paste to a fine consistency. Add water if you like. 2) In a pan, heat some oil, add the fresh red curry paste and saute. 3) Add all the vegetables and chopped tofu and stir them well. 4) Remove the pan from heat and slowly add the thick coconut milk. Stir in to form a thin paste. 6) Let the curry simmer. yummy recipe! looks wonderful too! Thai Curries are always one of the best after Indian ones for sure 9for me ;)). I have one daughter who swears by this curry and one who swears off.FIL who will not touch this So this is made rarely. Have a good mind to try this one out tomorrow. wonderful curry !! looks superb !! Thanks for linking to the event ! !